FHWA and ADOT engaged the U.S. Institute for Environmental Conflict Resolution (U.S. Institute) to facilitate a discussion regarding the Interstate 11 Tier 1 Environmental Impact Statement Corridor Study in Pima County, to augment the ongoing public involvement effort. The U.S. Institute conducted two sets of stakeholder engagement meetings (Group B and Group C/D, see I-11 Invitation Letter below) with the objective of facilitating additional productive Pima County community conversations to inform the I-11 Tier 1 EIS Corridor decision-making process. The results of these group discussions are summarized in the I-11 Corridor Stakeholder Engagement Meetings report prepared by the U.S. Institute and provided to FHWA and ADOT for consideration in the I-11 Tier 1 EIS process. Opportunities to provide public comments directly to the project team continue to be available at any time using various methods – please see i11study.com/Arizona/ContactUs.asp. As with all public comments, the purpose of the stakeholder engagement meetings was not to “vote” for a preference, but rather to generate information and ideas that would help FHWA and ADOT in making the decision regarding a Selected Alternative – whether it’s a Build Corridor Alternative or a No-Build Alternative. Two separate meeting groups (Group B and Group C/D), comprised of approximately 20 individuals each, explored discussions important to the communities surrounding the associated corridor options: B, C or D. Each group met three times in March and April 2018. In order to fill the group rosters, an I-11 Invitation Letter (see below) was circulated to 63 organizations in the Pima County area on December 12, 2017. 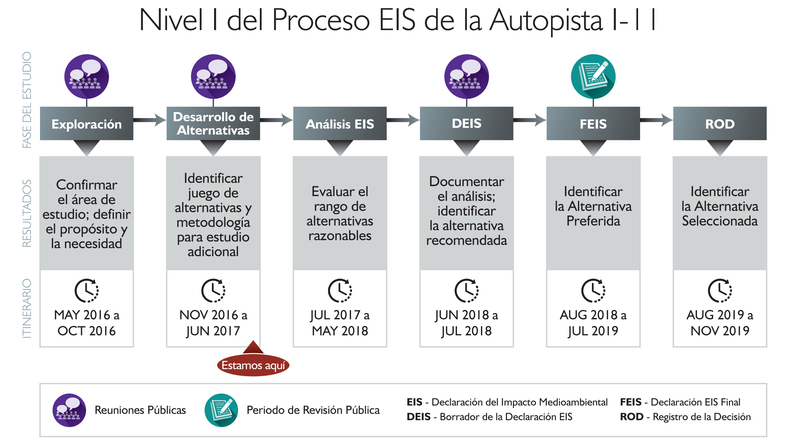 The list of 63 organizations was generated from the Tier 1 EIS interested stakeholders list previously collected during the last two years of the I-11 Tier 1 EIS Study. In addition, the invitation letter requested that it be circulated to any other interested stakeholder organizations. The final list of participating organizations is provided in the I-11 Interview Themes Final Document linked below. All submitted nominations were accepted and the identified individuals were assigned to the group of their choice.